Introducing our beautiful luxury Beach Villa in Ko Olina on the island of Oahu! Our villa is spacious with 3 Bedrooms and 3 Baths in over 1500 square feet of living space. Beautiful 8' tall sliding glass doors slide into the walls creating a seamless transition between indoor and outdoor living. The doors open up the living space to an expansive lanai adding an additional 220 square feet of outdoor living space with luxury seating. The custom designed Roy Yamaguchi signature kitchen offers Sub Zero refrigerator and wine cooler, Wolf appliances and a Bosch washer/dryer just which add to the conveniences of a condominium vacation instead of a hotel room. Interiors include travertine floors, granite countertops and African mahogany doors, windows and trim work. The new furnishings, Wi-Fi high speed internet, an iPod docking station, 2 DVD players, large flat screen TV's in every room and other amenities provide a lifestyle and vacation beyond compare. There are also 2 reserved underground parking spaces included with our unit in case you are traveling with another family or grandparents. The Beach Villas at Ko Olina are two luxury buildings gracing the white sands and turquoise waters of the Honu Lagoon 2, creating a sanctuary that is unrivaled in the islands. The Beach Villas offer every modern resort amenity including a beautiful lagoon pool with a sandy zero entry area for kids and 3 whirlpools. The exterior surroundings are furnished with exquisite outdoor seating and lounge furniture, including comfortable in-pool lounge chairs. There's something here to please everyone. The Ko Olina Resort and Marina is located on the sunny western coast of Oahu, approximately 27 miles west of Waikiki beach and 25 minutes from the airport. The resort features 4 pristine lagoons ideal for swimming, snorkeling and sunbathing. The best Luau is a short walk away at Paradise Cove. For boaters, the marina offers sightseeing excursions to see humpback whales and spinner dolphins play offshore during the day or sunset cruises during the evening. For those who enjoy golf, the Beach Villas are across the street from an 18-hole championship golf course designed by Ted Robinson, and home to the LPGA 'Fields' Open'. Roy's Restaurant is also located across the street at the golf course within an easy stroll. We have an amazing gym on property with sauna and on-board televisions on machines. A 1 1/2 mile beachfront walking/running path connects all 4 lagoons and the marina. Additional restaurants are located along the way at the Four Seasons, Disney Aulani and The Marriott Vacation Club. These restaurants include Longboards Bar and Grill and Longhi's at the Marriott Vacation Club and AMA Ama and others at Disney Aulani Resort and several others at the new Four Seasons. There is a commercial area within walking distance as well that has my favorite, Monkeypod, Island Vintage Coffee, Two Scoops Ice Cream Parlor, Just Tacos and a great little market for lunch and pick up items called Island Country Market. Disney Aulani has a beautiful full service spa and you don't have to stay there to schedule a service. Restaurants and activities within 3 miles of the Beach Villas include Wet N Wild (Water Park - a favorite of my children), Kapolei Theaters, Outback Steakhouse, Chili's, Baskin Robbins, Safeway grocery, Costco, Super Target, and, of course, a Starbucks. There are several professional Wolf grills located throughout the Beach Villa's pool area for your own cooking pleasure. The Master bedroom is furnished with a king bed, soaking tub and separate shower. The secondary master is furnished with a queen canopy bed, its own large bathroom with exquisite features and deep soaking tub/shower. The third bedroom has a full bed with a twin bunk and a twin trundle bed. The third bedroom has its own bathroom with shower, as well as a DVD player for the kids. The dining room table seats 8 comfortably plus there is a bar with 5 barstools. We have searched for the perfect vacation property for years, and we finally found it at the Beach Villas in Ko Olina. It is completely first class and luxurious. The beaches are uncrowded giving the feel of having your own private beach. You can rent paddle boards or kayaks at the Disney Resort. The sunsets are spectacular from the resort. Bring or rent snorkeling gear for an upclose view of the sea turtles and tropical fish that frequent the lagoons. I do have some beach toys as well as snorkeling equipment in the large storage bin on the lanai. Please check inventory before you purchase or rent. Whales are a common site from the beach and the restaurant/bar during December through March. We are confident that you will love it as much as we do! 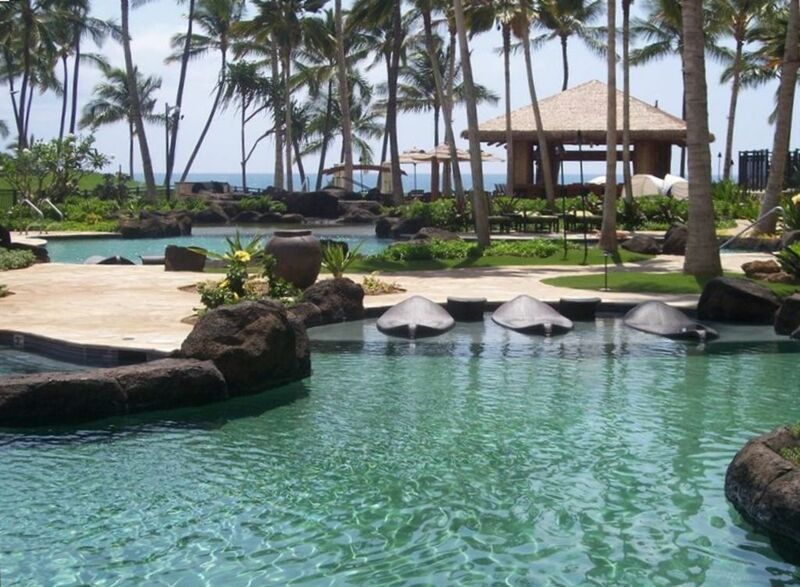 Beautiful pools, hot-tubs, fabulous gym, koi ponds and amazing BEACH! Numerous restaurants within walking distance. Daytime bar on premises. Golf across street at Ko Olina Golf. Beach Villas sit directly on the ocean, just walk from our unit past pools onto the beach. Our unit is on the 3rd floor of the Ocean Tower and has a beautiful view of the ocean from the lanai. New stacked full size washer and dryer. Dryer is a direct vent so drying time is extremely long. Spices, teas, coffee filters, etc..
Kayak and paddleboarding available for rent next door at Disney Resort. Numerous board games, cards, dominos, movies, beach toys and a pack-n-play for babies or toddlers are provided in our unit for family fun. Our party of 8 enjoyed a wonderful week at Ko Olina Beach Villas! The grounds are well maintained and the pools were amazing. We used many of the provided beach supplies (sand toys, boogie boards, snorkels, beach chairs and towels) and saw many fish and even turtles right in the lagoon. Great walking path that connects the lagoons and access to the restaurants at the adjoining hotels as well as in Ko Olina Station (which also has a few shops and small market). The condo was spotless and well stocked. We enjoyed sunrise and sunset views from the lanai. Michelle provided a lot of great information before our arrival and property management greeted us on check in and was available for any issues during the stay. It was also nice to have two reserved parking spots. Would definitely stay here again! Awesome and perfect family getaway! The grounds, amenities and unit all exceeded my expectations. For the money the value is really high and I think it is priced appropriately. I travelled with my husband, three little kids and MIL and it was perfect. The easy access to the perfect safe beaches and pools of different depths made it fun for everyone. The tiki bar was a hit and each age was able to relax, enjoy and have fun. Thank you so much for your review. I would love to have you and your family back anytime. Glad all enjoyed the pools, our bar and the beach! I think it is a bargain too for the price but sure appreciate you saying that after your stay. Will absolutely stay here again when we return. I have to say that these accommodations were a pleasure to stay in. We are a family of 6 with kids aged 10, 14, 17 and 19. From the moment we arrived we were greeted by a representative to walk us to the room and give us a briefing on the unit and the site facilities. She left us her cell contact for any issues that may arise but also for general island questions or suggestions which we actually took advantage of and the contact was more than happy to help out. The site amenities and facilities were clean, organized and tidy. There was always room around the pool areas and wasn't loud or disruptive even with smaller kids running around. The general appearance of the building and surroundings were in good condition considering the age of the site which i guess to be 10+ years old. there was minor maintenance around the facility taking place but it was in a very organized fashion. The beach was lovely. Very clean with lots of space. The only downfall was that there are no loungers available at the beach so anything you may need to have at the beach, you have to bring from the room itself which was available for use in a storage bin on the balcony. There were also site BBQ's available which we took advantage of which was great. Again, they were clean and well maintained. It seems that they do clean them daily. Now for the room itself. It was perfect for 6 people. You could do 7 -8 but i think the space would be stuffy at that point. With 3 full bathrooms it was perfect. The kitchen space was ideal, again with basically every kitchen appliance you would need to prepare any meal. The balcony was off the kitchen and the space was sufficient for 4-6 people. The one thing that threw me for a little bit of a surprise when we arrived was the balcony/room doesn't face the ocean direct. It is ocean view but in the distance. the room actually faces the east which i believe is the Four Seasons hotel. So, this was probably an oversight on my end as i thought the pictures shown were high up and direct ocean view, BUT, having stayed there I would prefer to have this view/side of the building as the direct ocean view units all face the pools in a "U" shape layout so i noticed that it was noisy due to may units pointing towards one another. I was again glad to be facing the outside surroundings. If this is within your budget, I don't think you will be disappointed. I would pick this site over Alunai as it was quite busy and noisy. So glad you guys enjoyed your stay! We purchased at the Beach Villas in Ko Olina because of the gorgeous beach and all of the amenities including the gym, pools, hot tubs, bar and the great Wolf grills which are so great to cook on while the kids play. We have had 8 in the unit numerous times, many times with 2 adult couples and 4 children and it works well. We have plenty of indoor and outdoor seating. It is 10 years old and I agree our buildings and amenities are well taken care of. Not sure if you had the opportunity to visit the gym, sauna or steam room but those facilities look brand new. Much of the equipment is new including the rower and many of the machines. I constantly replace furniture, cushions, bedding, kitchen equipment, etc... I just purchased a new full size washer and dryer instead of the small ones that came with the condo. I selected this condo for the reason you said you would stay here again...it is in a peaceful and quiet location while still having views of the ocean, just not over the pools which can become noisy. I do have a picture featured in my VRBO/Home Away ad that depicts the view and furnishings on the lanai. We sit beside a vacant lot and the closest building to our side is the Marriott Vacation Club property. Disney Aulani and is on the other side of our building. The Four Seasons is at the end of walking path beyond Disney Aulani. It is nice to have all of these properties close by since we can dine at their restaurants and utilize the Aulani and Four Seasons spas! Thank you for taking the time to write such a fabulous review. I never ask for reviews so its such a pleasure to see when folks feel the same way about our condo and the Beach Villas. If you get the chance to return, we would love to have you again! Overall experience was great. Owner was responsive and helpful. The direct view is of the Marriott next door but there is a nice ocean view as well. Overall our experience was excellent. Great value when compared to other other nearby resorts. Highly recommend this unit and this owner. Michelle and Ron were A+. condo to anyone looking for a relaxing stay in Hawaii. Beautiful property.--pools, nearby beach-- all great for soaking up the sun. The condo was all we could wish for. Great kitchen, loved how the balcony doors opened fully to make the balcony become part of the living room. Lots of water toys for my three year old granddaughter (thanks for the life vest and little watering can. My granddaughter used that for hours watering the plants around the pool!!). We all enjoyed walking along the beach path to the other hotels, and we did make use of their restaurants and car hire. Took us awhile to figure out the shuttle buses (reception not really very helpful with that information!). Was a really great condo. Chrstine...I am so glad you guys loved our condo and enjoyed your stay! It's great to be able to walk past our ocean pool and right out onto the beautiful beach! Hope you were able to enjoy our beach bar too! I make every effort to keep the storage bin on the lanai full of snorkeling equipment, beach toys, couple of boogie boards, noodle, floats, etc... so everyone has something to enjoy! It is so full that I have to keep my beach chairs inside the unit! So sorry about the front desk folks not being responsive to your question in re the shuttle between resorts here in Ko Olina and restaurants/shopping. We recently had a big turn over with staff and several of our front desk folks are new. I have already asked management to ensure that our front desk staff is educated regarding shuttle times. The shuttle is not used that frequently by guests since all the resorts, shopping and restaurants are within walking distance but they need to know for those guests that prefer the shuttle. Thanks for bringing that to my attention. Please come back when you are able. Mahalo! Ko Olina is on the opposite side of the island than Waikiki but an easy drive. It is peaceful, calm and beautiful and not commercialized and croweded like Waikiki. You are still within 35-40 minutes of Waikiki for amazing shopping and restaurants. Check in is at 4 pm and check out is at 10 am. I only book rentals during prime Summer weeks, Spring Break weeks & Holiday weeks from Saturday to Saturday for 7 nights only. If booking for 10 or more nights the Saturday to Saturday is waived. Please contact me via 970-618-7399 or email me before requesting booking online. Thanks for your understanding! Holiday bookings have 90 day cancellation policy and regular bookings have 60 day cancellation policy.